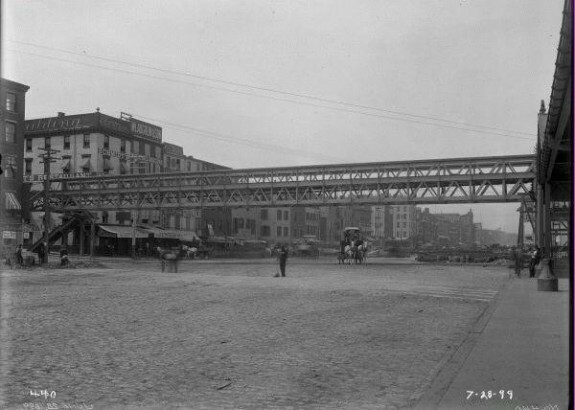 This 1899 scene, at Delaware Avenue and Chestnut Street, shows a bridge over Delaware Avenue leading to the recently-completed Chestnut Street Pier. Also known as Pier 5 South, this was both a working pier and a recreational pier at which people could enjoy some leisure time out on/over the Delaware River. Delaware Avenue was widened for the last time in 1898-99. 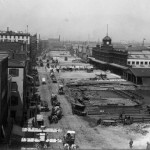 Here it is during this process on April 17, 1899, facing north near Chestnut Street. 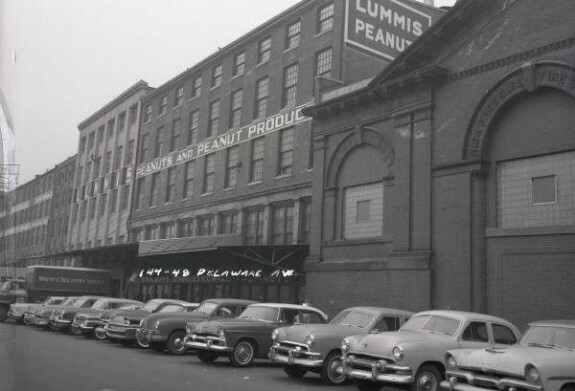 The only building that still remains from this photograph is the Philadelphia Cold Storage Warehouse building in the far distance. Furthermore, construction of the Delaware River (Benjamin Franklin) Bridge is years away. A busy (and wide) Delaware Avenue in 1905, with horse-drawn wagons carting produce and other edibles (and goods) from the central Philadelphia waterfront to neighborhoods throughout the city. 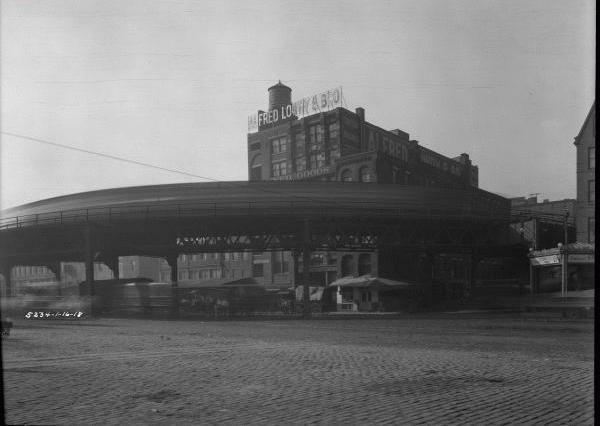 The structure appearing on the right is the Pennsylvania Railroad’s Philadelphia–Camden Ferry Terminal. Congestion of Delaware Avenue, even after it was widened in 1898-99, is apparent in this 1905 view looking south from Chestnut Street. The tracks visible here are those of the Philadelphia Belt Line Railroad, chartered in 1889. A single track of this railroad remains today within the center median of Delaware Avenue. This 1918 picture shows the Delaware Avenue Elevated as it makes its hairpin turn over Arch Street onto and over Delaware Avenue. Also known as the Ferry Branch, this El structure was built in 1908 and was dismantled in 1939. Horse-drawn wagons are traveling on Delaware Avenue, looking southwest at around Arch Street on August 26, 1920. 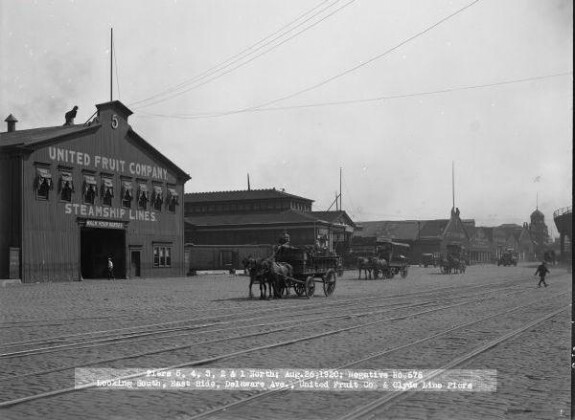 Pier 5, used by the United Fruit Company, is the most prominent of the 20-25 year old piers shown here. Within three years, more modern piers—Piers 3 and 5, still extant—will replace these piers. This 1941 photograph shows a quiet Delaware Avenue looking southwest at Arch Street. All buildings on the right were removed by the late 1960s for the construction of Interstate 95..
Cars are parked along the west side of Delaware Avenue in this 1960 view that also shows the High Pressure Fire Service building in the foreground. 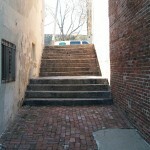 This structure is now being used as the headquarters of the Philadelphia Fringe. All other factories and warehouses in this shot have been demolished for the construction of Interstate 95. Delaware Avenue, the north-south thoroughfare closest to the Delaware River in Philadelphia, owes its existence to the richest man in America, who wanted a grand avenue along the central waterfront. 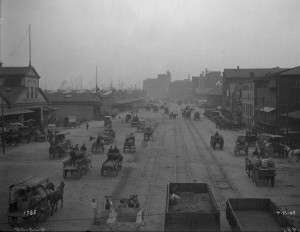 The street, including a portion renamed Columbus Boulevard in the 1990s, played a significant role in the development of Philadelphia’s maritime activity, particularly food distribution for the city. Delaware Avenue originated in the late eighteenth century as an irregular footpath built atop filled-up docks and wharves that had outlived their usefulness. It became a more formal thoroughfare as a result of $500,000 left to the city of Philadelphia by wealthy merchant Stephen Girard (1750-1831). Much of the Port of Philadelphia’s rise to importance is traceable to this bequest. Girard lived very close to Philadelphia’s busy waterfront, at his mansion and counting house on Water Street near Market Street. In the eighteenth and nineteenth centuries, sailing ships and then steamships bound for England, the West Indies, China, India, and other remote destinations routinely left from the city’s waterfront. Ferries and other boats on the Delaware River also linked Philadelphia to Camden and communities on the river and along the East Coast. Girard was familiar and unhappy with the congested state of Philadelphia’s waterside pathway as it had developed by the early nineteenth century. He knew that trade had suffered without a capable waterfront roadway. In his will, he specified that a wide boulevard should be constructed beside the river and specified that this street be named “Delaware Avenue.” His bequest allowed for extending the street eastward into the Delaware River, incorporating existing docks, and using landfill to create the roadbed. 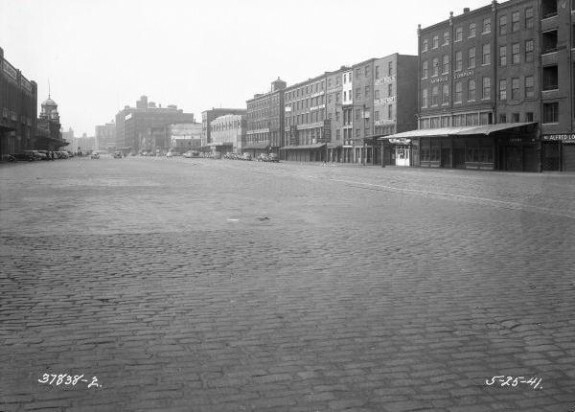 Taking place between 1834 and 1845, the construction of Delaware Avenue produced a proper street twenty-five feet wide, paved with Belgian blocks, between Vine and South Streets. Girard’s money also initiated the construction of bulkheads and the first lighting by the river—first with gas lamps, later with arc lamps. The City of Philadelphia expended $249,696 of Girard’s legacy. Commerce increased rapidly, as Girard had envisioned. But Delaware Avenue became a victim of its own success, as traffic tie-ups and other problems grew each year. In response, between 1857 and 1867 the city widened the avenue to fifty feet, and expended $313,726 from the Delaware Avenue Fund. 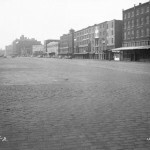 The thoroughfare also was extended north of Vine Street and south of South Street in the 1870s and farther thereafter. 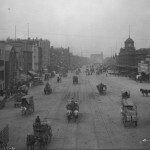 Between 1897 and 1900, the avenue was broadened again, to 150 feet. 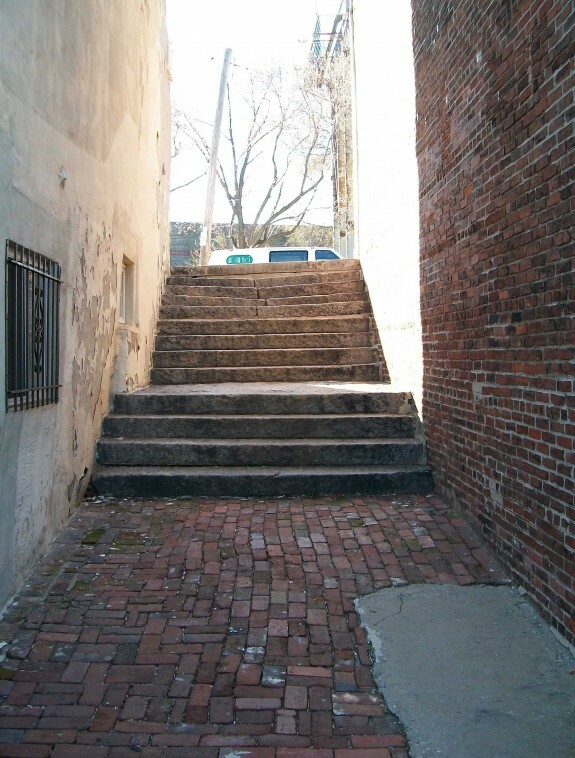 This work was the most expensive civic improvement project in Philadelphia up to that time. 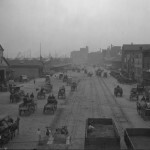 As it developed during the nineteenth and early twentieth centuries, Delaware Avenue became the main transportation corridor for the shipping and handling of food and general cargo for all of Philadelphia. 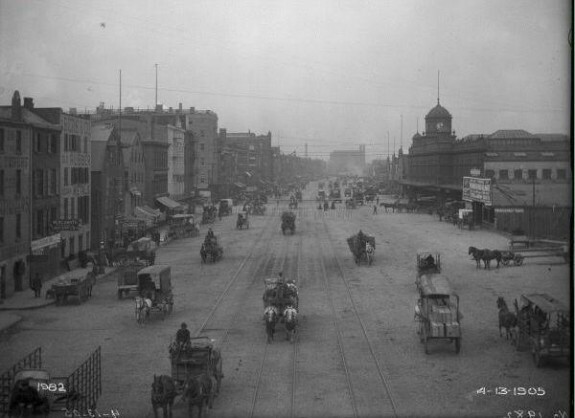 Early photographs show hordes of horse-drawn wagons jamming the street, most loaded with perishable goods. Dock Street near Delaware Avenue was the city’s primary food distribution center for more than a century. 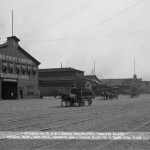 Beginning in the 1890s two sets of railroad tracks also ran on Delaware Avenue to meet the freight hauling needs of docks and industries alongside the river. Known as the Philadelphia Belt Line Railroad, these tracks extended about eighteen miles from Port Richmond to South Philadelphia. Also, the Delaware Avenue Elevated operated atop the southbound lanes of the avenue from Arch Street (where it connected with the Market Street Subway at Front Street) to South Street, where it stub-ended. 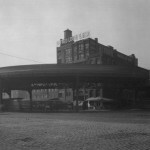 Also known as the “Ferry Branch” or “Ferry Line,” its stations served the many ferries to New Jersey. The transit line lost passengers as ferry traffic diminished after the Delaware River (Benjamin Franklin) Bridge opened in 1926. Most ferries ceased operating by 1938, and the Ferry Branch stopped running the following year. 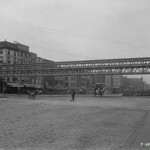 The elevated structure was then dismantled; not a trace remains. Two years later, the Italian community of South Philadelphia persuaded City Council to celebrate the 500th anniversary of Christopher Columbus sailing to America by renaming Delaware Avenue after the explorer. Citizens in the northern precincts of the city, aided by members of the local Lenni-Lenape tribe, fought the name change. Although a compromise was reached in which the avenue was renamed only south of Spring Garden Street, street signs reading “C Columbus Blvd” were defaced for years after. The Commonwealth of Pennsylvania paved and landscaped Delaware Avenue in the 1990s. Instead of a rough stone roadway filled with ruts and railroad tracks, the street is now smooth and ornamented with greenery. Columbus Boulevard is, indeed, a fulfillment of Stephen Girard’s desire for a wide, tree-lined thoroughfare along the Delaware. Harry Kyriakodis is the author of Philadelphia’s Lost Waterfront (The History Press, 2011) and Northern Liberties: The Story of a Philadelphia River Ward (The History Press, 2012). He is a founding/certified member of the Association of Philadelphia Tour Guides and has lived at Pier 3 Condominium since 1997, when and where his fascination with Philadelphia’s waterfront district began. Brandt, Francis Burke. The Majestic Delaware: The Nation’s Foremost Historic River. Philadelphia: Brandt & Gummere, 1929. Ingram, Henry Atlee. The Life and Character of Stephen Girard of the City of Philadelphia, in the Commonwealth of Pennsylvania, Mariner and Merchant. 6th ed. Philadelphia, 1886. Kyriakodis, Harry. Philadelphia’s Lost Waterfront. Charleston, SC: The History Press, 2011. ———. On the Delaware River: The Port of Philadelphia. 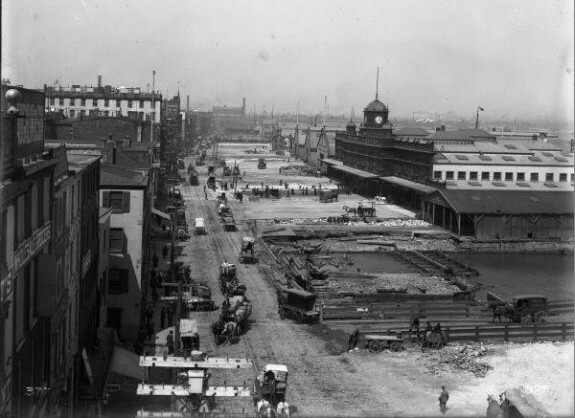 Philadelphia: Department of Wharves, Docks & Ferries, 1921. ———. The Port of Philadelphia. Philadelphia: Department of Wharves, Docks & Ferries, 1930. ———. The Port of Philadelphia: Second in the United States: Its History, Facilities and Advantages. Philadelphia: Department of Wharves, Docks & Ferries, 1926. Smith, Philip Chadwick Foster. Philadelphia on the River. Philadelphia: Philadelphia Maritime Museum, 1986. Taylor, Frank H., and Wilfred H. Schoff. The Port and City of Philadelphia. Philadelphia: 12th International Congress of Navigation, 1912. Watson, John F. Annals of Philadelphia and Pennsylvania, in the Olden Time; Being a Collection of Memoirs, Anecdotes, and Incidents. New York: John Penington & Uriah Hunt, 1844. Wildes, Harry Emerson. Lonely Midas: The Story of Stephen Girard. New York: Farrar & Rinehart, 1943. Workshop of World: A Selective Guide to the Industrial Archeology of Philadelphia. Wallingford: Oliver Evans Press, 1990. Stephen Girard Collection, Girard College, 2101 S. College Ave., Philadelphia. Contains Stephen Girard’s original archival documents and a complete set of microfilm of Girard’s personal papers. A duplicate set of microfilm is available at the American Philosophical Society. Philadelphia Record Photograph Collection, Historical Society of Pennsylvania. My Great Grandfather Michael J. Kelly of M. J. Kelly Meats and Provisions owned a warehouse at 24 S. Delaware Ave. 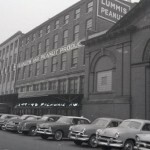 He also was the largest Butcher at Reading Terminal Market from 1892-1965. He supplied all of the Hotels and institutions as well as the Navy and Army. Im looking for photos, please advise?